In celebration of St Patrick’s Day, I’ve decided to post something which is of Irish origin and probably their most popular dish so far, the Irish stew. Irish stew is a traditional food of Ireland made from lamb/mutton, potatoes, onions, and parsley. But several variations exist now where barley, carrots, turnips and even stout beer are added. This is then boiled and simmered slowly for up to two hours to extract the good flavours out of the meat and bones. Irish stew is a product of long history and started since after the seventh century BC during the Celtic invasion of Ireland. Since then they started to possess bronze cauldrons for cooking stews. During that time it was the dominant cooking tool in ancient Ireland, hence you see a lot of different stews that originated in there. Then in 16th century, potatoes which is the key ingredient in this dish was introduced from South America and that gave birth to the Irish stew that we know of this time. Dredge meat in flour then set aside. Place butter in pot then in medium heat brown lamb pieces. Add onions, barley, thyme and bay leaf. Pour the stock then bring to a boil and simmer for 45 minutes in low heat. Add the carrots and potatoes on top of the stew then continue to simmer for 45 more minutes in low heat. I love the look of this Irish stew Raymund! Hearty and yummy! That’s just fantastic looking. So hearty. I’ve never tried this. Looks great and I love stews! 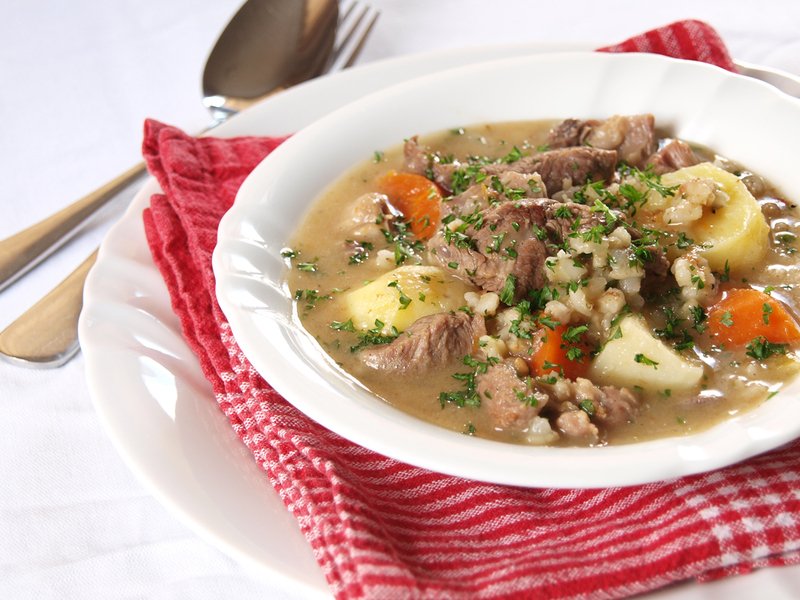 I love a good Irish Stew – great recipe! That stew is making me hungry, Raymund! Happy Saint Patrick’s Day! Next time I’ll visit my grocery store I will buy this pearl barley.. It flirted with me the last time but I left it in the shelf..
Lovely Stew Reymund, have a wonderful weekend! We love stews and I am a huge fan of pearl barley. No need to wait until next March 17th in our house to make this! That’s some good looking Irish Stew I’m gonna have to make soon! What a perfect bowl of Irish Stew! It’s cold and rainy here and that would certainly hit the spot! What a beautiful recipe for St. Patrick’s Day…. I have never tried this stew but seeing yours I feel like having some now. happy st. patrick’s day.. stew looks tempting..
wow! very interesting to make me droll, I love you all very amazing recipe, thank you so much. Yum! I love your version of classic Irish stew. It looks so authentic and delicious! I don’t know how I missed this post but this just looks so wonderful and hearty. I love a classic Irish stew. All of those vegetables with the meat makes it so hearty! Such a good hearty meal – would go perfectly with a pint of Guinness for St Patrick’s Day ! You are welcome to join in my monthly food blogger event THE SOUP KITCHEN, here all bloggers are welcome, hope to see you participate soon. Different theme each month. April’s theme is Chinese Soup.